Learn about important new developments and view the latest upcoming events for your area. More than 150 people expected for the now ANNUAL event. The After Party at CI Shenanigans in Tacoma, in partnership with HCPC, and more than 50 expected. Or join us for both- that is ideal! I use this newsletter to share upcoming events, deadlines, news and meeting information. Recently, we have had a few people tell us they did not know about upcoming case manager events or other events we coordinate. Upon investigation, I found that they received, but do not read/open this newsletter. This made me want to stress to everyone that - THIS NEWSLETTER IS THE BEST WAY TO FIND OUT WHAT IS HAPPENING. If ever you feel we neglected to share an important event, our staff always wants to know, but I promise we are trying to keep you informed of upcoming information. Do you know someone that has recently changed positions? We want to know… Each month we will share the updates in our monthly newsletter, helping you stay connected and keep informed about community changes.” Click Here to send us any updates. It can be hard to see the silver lining when it is very, very cloudy. You don’t see the strength you can provide others because you don’t even know you have enough for yourself. But when we stop thinking, planning, and fighting, and just take a minute to “be present”, maybe a new normal can be found. 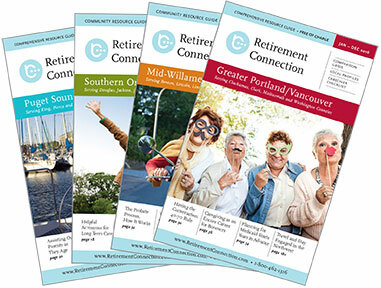 Apply or submit new positions online through Retirement Connection's Job Board. or by phone at 503-505-5865! Have a community or public event you'd like to share? We'll post it for free to help you get the word out! Looking for events in another region? Try one of the links below. Additional copies of the Guide are available at no cost and are the perfect resource for health fairs, workshops and your marketing packets. Guides are located at EVERY Senior Center, Hospital, Library and Meals-on-Wheels sites. You can order as many as you need to serve the families in your community. Add a label to the cover to highlight your business and use the guide as a giveaway.